Today our expert guest is Lee Caraher, the founder and CEO of Double Forte, a national public relations and digital media agency that works with beloved consumer, technology, and wine brands. 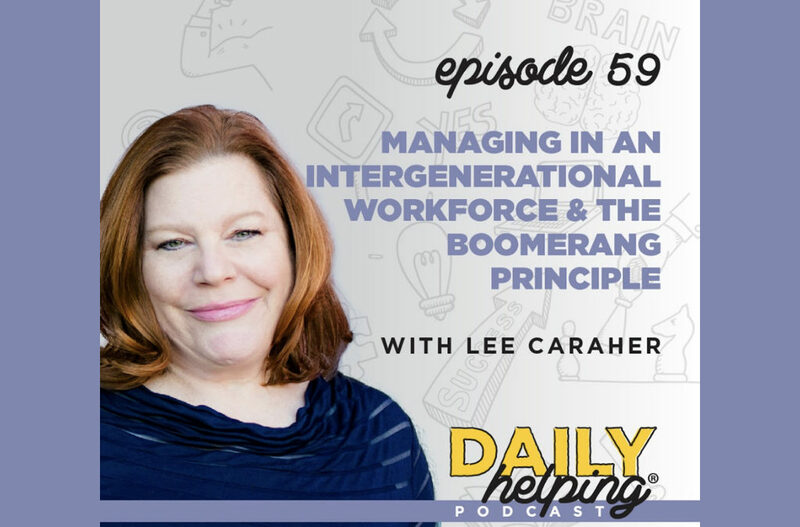 Lee is also the author of two books: Millennials & Management: The Essential Guide to Making it Work at Work and The Boomerang Principle: Inspire Lifetime Loyalty from Your Employees. The former is inspired by Lee’s own experience epicly failing and then succeeding at retaining millennials in her business and the latter is a pragmatic and actionable guide to creating high-performing work cultures that are ready for the future. But there is still a lot of talk about the “culture clash” being caused by this intergenerational workforce… so what’s that about? One of the big differences is that the younger generations have an expectation for work-life integration, as opposed to work-life balance. When you talk about balance, you’re generally talking about a compartmentalized and even split of two different parts of your life… and that doesn’t really work that well, in practice. Work-life integration is constant: from the moment you wake up to the moment you go to sleep, you can get through both your work responsibilities and personal responsibilities and optimize them however makes sense. It’s a concept that sort of flies in the face of a typical 9-to-5 mindset. It’s different, but not bad. In fact, it has distinct benefits for everyone in the workforce – like being able to leverage the times of day you are most productive for your most important work – but previous generations didn’t necessarily realize they could ask for it. Lee believes a lot of the “culture clash” can be solved through effective communication, particularly setting clear expectations up front (or asking for clear expectations if they are not provided). “Don’t assume anything. You have to absolutely set your own expectations for what the values and what the behaviors are in your own organization.” This is useful for any generation, not just Millennials. As is The Boomerang Principle, or the belief that those organizations that allow and encourage their former employees to return to them as employees have a strategic advantage over those that don’t. This can be a point of contention between older and younger employees. Historically, the train of thought has been you left the company so you somehow betrayed it. But paying employees doesn’t create loyalty – it’s a transactional relationship. On top of that, continual improvements in health and technology mean that people will be able to work longer. A 45+ year career just isn’t realistic. Today’s young adults will likely have 60-70 year careers, so it makes sense that they’ll want to try a few different roles and functions in that time. If we can keep people we want in our organizations for one more year, Lee says, we are improving our process, improving our profit, and improving our culture – and that’s what sustainability will be in the future, as we think about longer careers and many careers for people over time.